Apple is really on a roll today with hardware and software releases left and right. We’re so used to having the Cupertino-based company hold big press events and make a song and dance about product releases that when new accessories are released they almost slip under the radar. Apple’s first official iPhone 6s / 6 Smart Battery Case which was released earlier today now has some company in the form of a new and improved Lightning to SD Card Camera Reader that comes with some additional benefits for those with an iPad Pro, as well as support for iPhones as long as they are running the latest released iOS 9.2, or over. Unlike Apple’s first foray into battery packing cases for the iPhone, this new Lighting to SD Card Camera Reader isn’t entirely a new product. It represents more of a continuation of an existing accessory line that was initially introduced to be an iPad-specific piece of kit. In fact, not only is the little piece of equipment carrying the same name as the accessory that preceded it, but it also has the exact same visuals and pricing point. With that said, it does come with one distinct difference; it now supports the faster USB 3.0 transfer speeds, meaning that it will greatly appeal to iPad Pro users because iPad Pro supports USB 3.0 speeds through its Lightning port. The functionality offered by the reader is also fairly identical to the product that it replaces in Apple’s accessory lineup. Usage of the hardware affords owners with the ability to read and import photos and videos loaded onto a compatible SD card directly from the card onto a connected iPad tablet. iPad owners can then view and edit the files directly before choosing to save them or apply the changes directly back to the SD card housed in the handy little reader. The accessory itself may not immediately seem like it would appeal to the masses, but for those who own the new iPad Pro, as well as the Apple Pencil, having an accessory of this nature supporting the faster data speeds can significantly improve productivity when it matters. Apple is also keen to stress that those owning an older iPad model other than the iPad Pro would not benefit from the improved data transfer speeds found within. 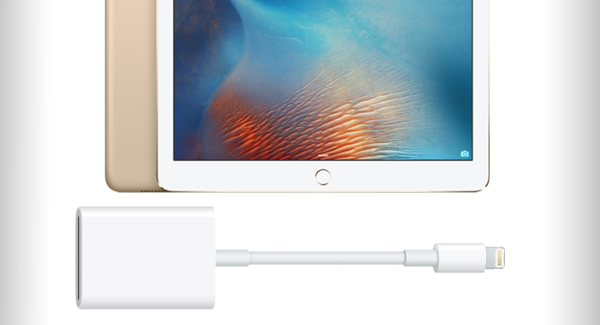 Purely because they don’t have an upgraded Lightning port that ships with the iPad Pro with USB 3.0 support. The new Lighting to SD Card Camera Reader carries the model number MJYT2AM/A, while the model number for the older accessory which was released back in 2012, is MD822ZM/A. That said, the adapter is compatible with all iOS devices sporting the Lightning port, including the iPhones, meaning you can import videos and photos to your iPhone via USB using this accessory. This was something which was not possible with previous iteration of this accessory. To use Lightning to SD Card Camera Reader with an iPhone, you will need to update to the latest iOS 9.2 firmware. 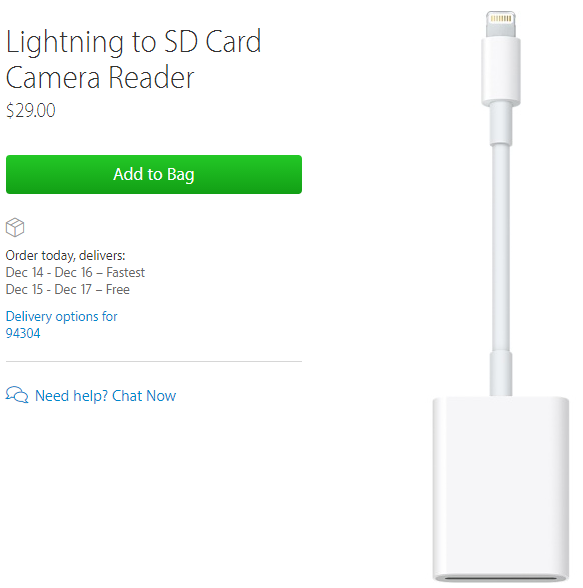 The adapter is available from Apple right now for $29.